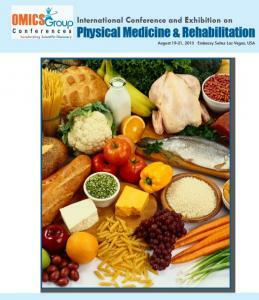 International Conference and Exhibition on Physical Medicine & Rehabilitation from 19-21 August 2013 at Embassy Suites Las Vegas, USA. LOS ANGELES, CA, July 15, 2013 /EINPresswire.com/ -- A person is called healthy only when she/he is blessed with functional and the metabolic efficiency. Sustainable healthy living is possible only when a right proportion of the physical, mental and the social wellbeing is maintained. Physiastry, also called as rehabilitative medicine plays a vital role in the perfect management of healthy living. Dr. Frank H. Krusen coined the term ‘physiatry’ in 1938. It is a branch of medicine that aims to enhance and restore functional ability and quality of life of people with physical injuries and disabilities. It mainly aims at restoring optimal functioning of the people with disabilities. Keeping the importance of this branch medicine the OMICS Group announce an International Conference and Exhibition on Physical Medicine & Rehabilitation from 19-21 August 2013 at Embassy Suites Las Vegas, USA. This event aims at bringing a unique international mix of health concerned research institutions, leading universities, government organizations, treatment, and rehabilitation centers across the globe together making the conference a perfect platform to share novel therapeutic innovations and challenges in the field of Physical Medicine & Rehabilitation. A special workshop on Ultrasound Guided Platelet rich Plasma (PRP) is being conducted at the sidelines of the event, with the focus on regenerative injection techniques. The agenda of the workshop that is part of the bigger event revolves around prolotherapy and similar approaches. The conference is organized over three days and the constituent tracks focus on knowledge-sharing about physical therapy and treatment of injuries to sportspersons, in addition to useful insights into trauma and pain. Experts in the respective practice of rehabilitation is associated with some addiction in patients will share valuable insights. The open access journal of Physical Medicine and rehabilitation; and the journal of Primary Healthcare publish abstracts of the physical medicine and rehabilitation conference indexed as part of the special issue with a CrossRef unique identifier.